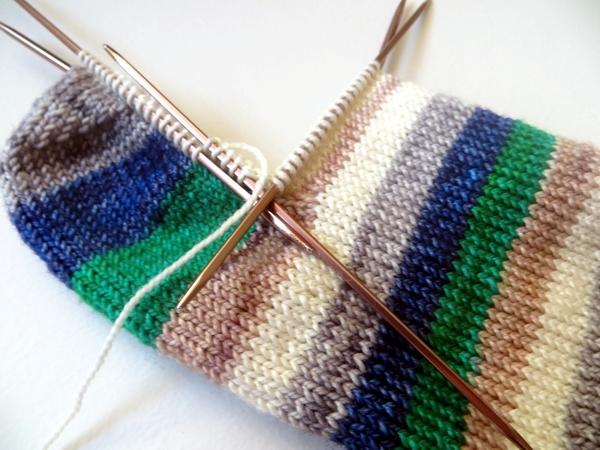 Do you ever look at some knitting and think, "I would like to eat that"? Probably you don't. And probably I shouldn't mention that sometimes I honestly do because that is just weird. I mean, in my defense, obviously I am not about to go gnawing on wool. It's just that there is something so adorable and huggable about some fibers or colour combinations and particular runs of stocking stitch - and I must say, this sock is looking very crisp - that the words leap into my head before I can tell them how very wrong they are. What I should be thinking is, "I would like to never sleep again, so I can look at that forever." But what comes out is "I want to eat this sock", so there you go: my cross to bear. You know what, a few years back I posted a picture of a knit with a needle stuck through it, and somebody commented that I am a bad knitter for doing that because surely I am splitting the yarn. So, just in case anybody is tempted to follow my bad example here, I will mention that I always slip the needle through an actual stitch so that it doesn't split the yarn, and, perhaps even more importantly, so I don't lose the needle. I am really, really loving this Vesper colourway. It's called Frost and I can't believe that beige and grey and white could possibly fill me with so much energy. Or maybe it's the magnitude of the calm they induce that makes me feel like I could knit for days? As I've been knitting, I've been thinking of the cooler weather that's coming, probably in just another few weeks. Soon I'll be wearing these socks and the others I've spent the summer working on, and I'll be wanting to pair them with other warm things. And now that I'm not going back and forth to the cottage and countering the car knitting time with hours spent in the lake every day, I might actually get time to knit some of them. 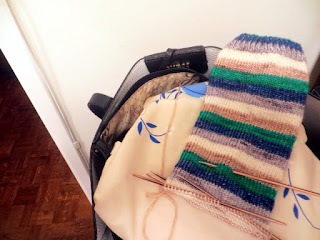 But for now: I am enjoying every stitch of this project. Knowing how to knit is such a wonderful gift, isn't it?